"hey, wait a minute, i recognize you, aren't you barack obama." it must have gotten so bad that michelle decided she had to separate them. 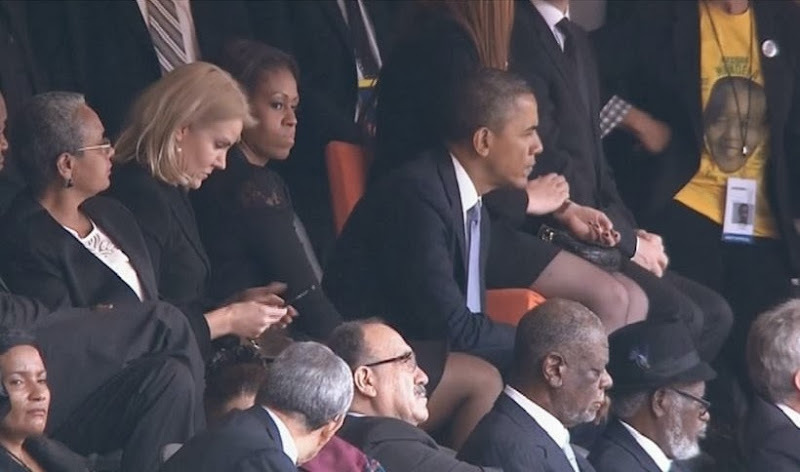 helle was likely furiously texting her gay husband (who lives in switzerland), "you shoulda been here, stephen, obama is hot!" 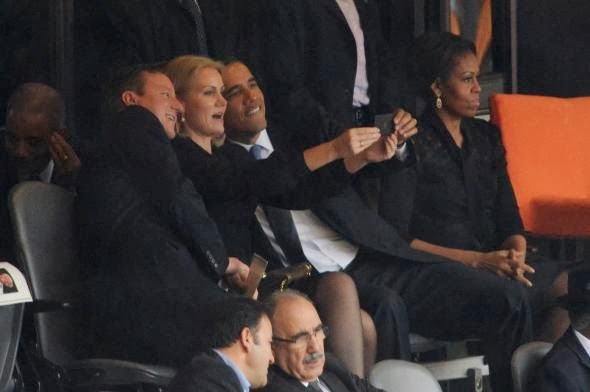 i guess this will be the photo that justifies the OED's choice of "selfie" as the word of the year. it's really true, everyone is doing selfies. these photos are circulating the interwebs, but i found them here (with a little help from my sister). it was in this article in the reno gazette journal. i can't quite say that i think it's wrong per se, but somehow it is. or at the very least very colloquial. 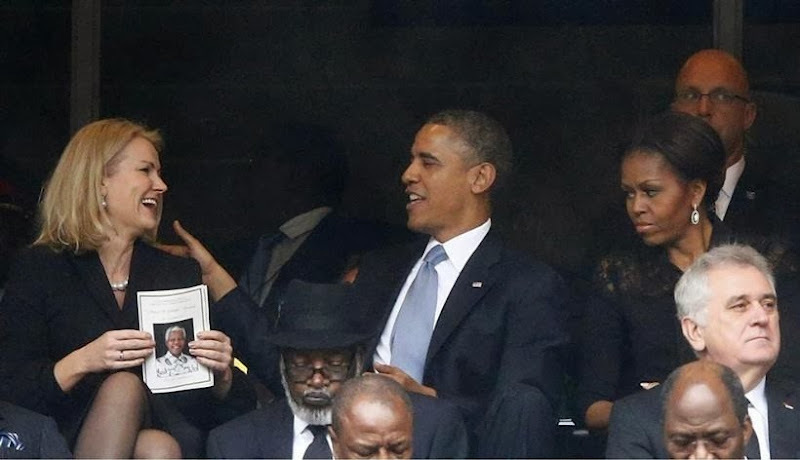 You might be interested in this from the photographer who took the picture: "Anyway, suddenly this woman pulled out her mobile phone and took a photo of herself smiling with Cameron and the US president. I captured the scene reflexively. All around me in the stadium, South Africans were dancing, singing and laughing to honour their departed leader. It was more like a carnival atmosphere, not at all morbid. The ceremony had already gone on for two hours and would last another two. The atmosphere was totally relaxed – I didn’t see anything shocking in my viewfinder, president of the US or not. We are in Africa." Too funny. 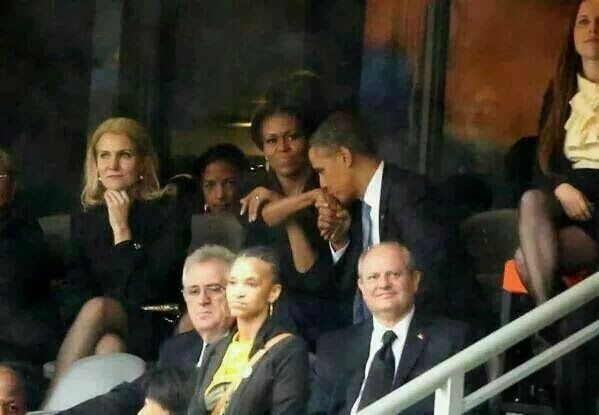 Helle thorning-schmidt seems to prove there's no connection between sincerity and being a politican. 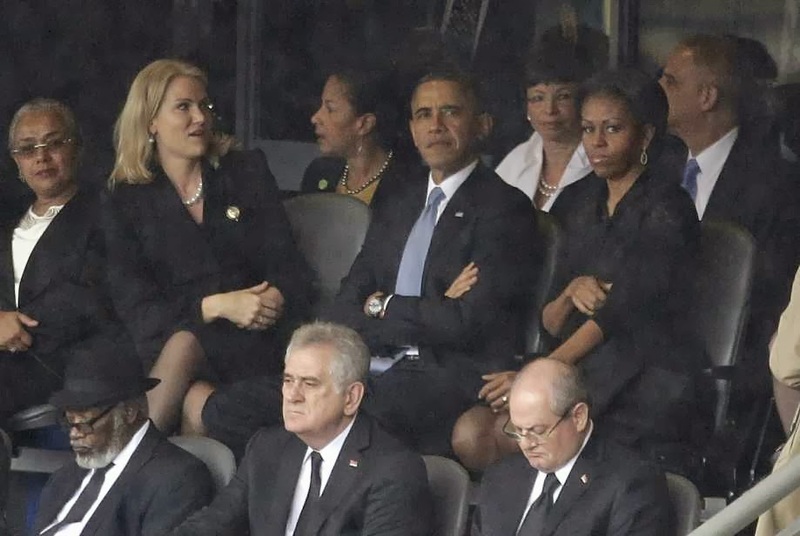 It would've been a better photo op if she had been sitting between Obama and Putin. Who knows what to really make of it. Photos can be so taken and shown so out of context. I was just thinking that maybe, and since the whole funeral is being taken with that joy of his life thing, maybe there was a truly joyful moment of laughter and then someone get all up in their face and "snap" you've got disrespectful whosit and whatsit. And maybe you've got a "treasure your loved one because they may one day be gone" moment and "snap" having to placate an annoyed wifey. God, to be a fly on the wall...eh?